At U-Fab Boats we pride ourselves in producing top quality pontoons & pontoon boat kits. extruded hat bar cross-members, 2", 3" 4", 5" or 6" high, are standard for all boat kits, 7' - 25' long. Longer length hat bars are available as a non-cancellable order. Choose from various sizes for the application that best suits you.Our pontoons are made with an aluminum/magnesium alloy. 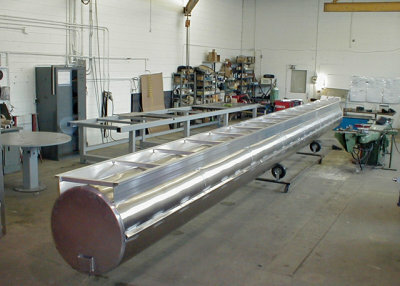 2 aluminum pontoons, each with side and bottom keels, front water deflectors, full length risers, sealed chambers at 5 ft. lengths or less and a rear mounting transducer bracket. Aluminum extruded cross-members x width of boat. Additional bars for reinforcement at motor mount and bow. Aluminum motor support (20 inch transom). 3 in. wide aluminum edging for complete perimeter. Our pontoons are made with type 5052 H32 aluminum, an aluminum / magnesium alloy most resistant to corrosion in fresh and sea water.